Serving one large platter when entertaining is a smart strategy. You can easily create a tray of delicious and healthy treats for your guests before they arrive, leaving you relaxed to enjoy the party. Read on to find out how to create your own Mediterranean, Middle Eastern or Scandinavian themed festive trays. But first, take a look at how simple it is to make a Modern Antipasto Vegetable Platter. Choose radishes, vine tomatoes, string beans, rainbow carrots, endive leaves, green olives, and a beetroot dip, for a fresh and healthy tray. 1. Feta–cube a fresh block and sprinkle with paprika for 130mg of calcium per 40g serve. 2. Chickpeas – with lemon juice and flat-leaf parsley. High legume consumption contributes almost 10 per cent towards the protective effects of the Mediterranean diet. 3. Spicy dip – with chargrilled red capsicum or tomatoes, coriander and chili, for the antioxidant lycopene, which helps protect skin from sun-induced ageing. 4. Sliced cucumber – to cool down after the spicy dip, and has at least triple the antioxidant intake when the skin is left on. 5. Black olives– enjoy their healthy monounsaturated fats. 6. Greek yoghurt has twice the protein content of regular yoghurt and a delicious creaminess. 7. Pistachios – rich in the antioxidant arginine, which is used by the body to make nitric oxide for healthy blood pressure.8. Pita – toast in the oven with a sprinkle of sumac and go for high-fiber whole meal. 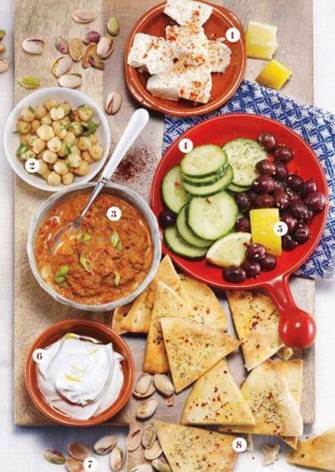 Enjoy the best of middle eastern flavors such as olives, feta and a tasty dip. 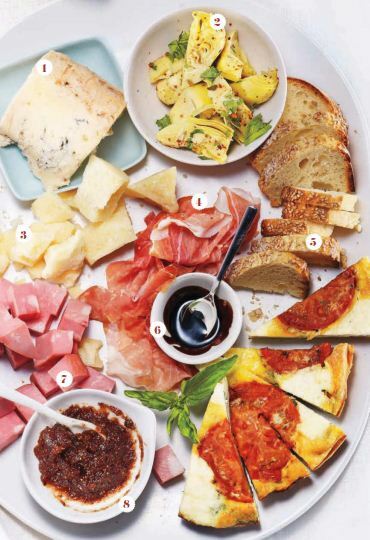 For your Italian-inspired tray, think of strongly flavored cheeses paired with a delicious prosciutto! 1. Gorgonzola– even a small portion of this strongly flavored blue cheese will give your guests essential vitamin a, phosphorous and zinc. 2. Artichokes – pick up a jar of marinated hearts for dietary fiber, folate and vitamin k. Drain well to remove excess oil and garnish with parsley and a pinch of chili flakes. 3. Grana padano– parmesan has one of the highest calcium contents at 1120mg per 100g, and it crumbles well into cubes. 4. Prosciutto – or parma ham trimmed of the large strips of selvedge fat will curb kilojoules. 5. Bread – go for ciabatta, olive bread or a traditional pane cut into smaller slices to avoid overdoing the carbohydrates. 6. Aged balsamic – richer in flavor and antioxidants than white vinegars, it’s the perfect pairing for aged cheese. 7. Mortadella– have just a small portion as this flavor some deli meat can have at least 50 per cent fat content. 8. Olive and red pepper tapenade– for a boost of antioxidant carotenoids and vitamin E.
Traditional Nordic cuisine features cured and smoked fish and dark bread, and is now being studied for its health-giving properties. 1. Cream cheese and cucumber spread – use light cream cheese to save kilojoules and mix with finely sliced cucumber. 3. Capers – pickled flower buds that are high in plant phytochemicals. 4. Smoked salmon – a plentiful source of heart-friendly omega-3s. 5. 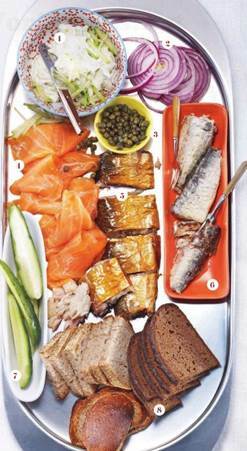 Smoked trout – another popular oily fish high in omega-3s and with 18g protein per 75g serve. 6. Sardines – rich in vitamin d and calcium from the edible bones. 7. Cucumbers – serve up fresh wedges cut lengthwise for their high water content and only 15kj per ¼ cucumber. 8. Rye and pumpernickel bread – traditionally, dark breads have less gluten compared to wheat-based breads.